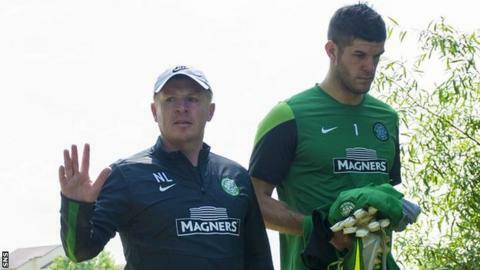 Celtic manager Neil Lennon believes summer bids for his top players are "inevitable". The Scottish champions are not in action this weekend and Lennon intends to assess possible targets as part of his building for next season. And Lennon told Fifa's website: "I think there will be suitors for a couple of our big players. "And one or two are coming out of contract, so you'd have to expect they'll be leaving." Georgios Samaras is one of those coming to the end of his deal while England goalkeeper Fraser Forster and Dutch defender Virgil van Dijk would be considered among Celtic's prize assets. Lennon has played down speculation linking him with the vacant post at Norwich City and appears set on planning for the new term with Celtic. "Realistically, I think we have to expect another decent turnaround, with a few players going out and few coming in," explained Lennon, who lost Gary Hooper, Victor Wanyama and Kelvin Wilson to English clubs last year. "Bids are all but inevitable for a couple of our players; it's just whether we accept them or not. "But everyone has their price and we're preparing with that in mind, looking at other options for the positions concerned. "We're already looking at a few players we like, and with the league now settled, it gives me the space to go out myself and look at a few who are under consideration. "But whether we can keep on unearthing little gems, or big gems, is another matter. "Our strategy has worked on the whole, but other clubs are now looking at our model and trying to copy it. "And you can't always get your signings right. You just hope that your record of good ones outweighs the bad because it's such a crucial part of the job."